Are you pregnant? Read our instructions for use in the frequently asked questions. This Serum with a stable, effective form of Vitamin A helps improve skin structure without irritating, as can be seen with retinol or Vitamin A Acid. The product is a powerful supplement to the basic products in Dr. Jetske Ultee’s range and has been specially developed for thinner skin with signs of ageing. The Serum helps the skin become smoother and stronger. With long term and consistent use the fine lines will become less visible. Vitamin A also has a proven effect on blocked pores, course skin texture and acne complaints. Formulated with soothing and skin barrier repairing ingredients. 1. What does the Serum do? The Serum helps reduce signs of skin ageing. Vitamin A ensures an improved production of collagen. The skin acquires a stronger structure. This process helps reduce fine lines, give the skin a more youthful radiance and prevent new wrinkles from forming. The Serum is also effective for blocked pores, course skin texture and impurities. Long term and consistent use will make the skin smoother and more even. 2. What makes this Serum special? The active ingredient in the Serum is Hydroxypinacolone Retinoate. This is a unique, stable and extremely mild form of Vitamin A. 3. How does it differ from other forms of Vitamin A? Vitamin A comes in many different forms. Their collective name is retinoids. The two most well-known forms in this family are tretinoin (Vitamin A Acid) and retinol. The first chemical has a powerful effect on the skin structure and therefore comes under medicine. A cream with Vitamin A Acid is registered as a medicine for the treatment of acne. Years of experience and research has told us that Vitamin A helps acne but also has a rejuvenating effect. It is not yet common practise to ask your Doctor for a prescription for signs of ageing. Those who want to use Vitamin A for wrinkles have to settle for the freely available forms of retinol in ‘normal cosmetics’. Retinol also has a proven effectiveness in improving the skin structure. But the ingredient is the same as Vitamin A Acid in that it is pretty unstable and also has an extremely irritating effect on the skin. That is why creams always contain quite low concentrations of the chemical. This means that the effectiveness will automatically become reduced. This Serum, therefore, contains a new and unique form of Vitamin A. Retinol needs to be converted into an active form in the skin before it can get to work in the cell, whereas the active ingredient in this Serum (hydroxypinacolone retinoate) can bind directly in the cell. This makes it very effective. As well as this the Serum is skin friendly and is less likely to cause irritation than retinol or tretinoin (Vitamin A Acid). 4. How (often) should I use the Serum? 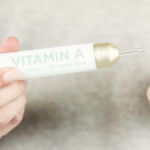 Vitamin A Serum makes a dynamic addition to the basic products by Dr. Jetske Ultee. The product absorbs in easily and makes the skin wonderfully soft. It is important to increase its use gradually (start with two to three times a week). Begin using the Serum after your skin has become accustomed to the other products. The Serum is the third step in Dr. Jetske Ultee’s 5 step plan. If you also use the Exfoliant, you can apply this during the daytime and the Serum in the evening. Apply the Serum and the Exfoliant alternately, before bedtime. Apply two pumps of the Serum onto your hand and apply conservatively. Allow the product, as with the Exfoliant, to absorb in for ten minutes before applying the Moisturizer (step 4). 5. Is the Serum only suitable for older skin? Definitely not. Vitamin A is certainly a tried and tested ingredient for reducing the signs of skin ageing, but the substance also works preventatively. It makes sure the skin structure stays lovely and firm by, among other things, combating collagen breakdown. And that process starts around the age of twenty five, thirty. The Serum is not only effective for fine lines and surface pigmentation spots, but can also improve skin with blocked pores and acne complaints. Always look at the needs of your skin, instead of just your age. 6. Is the Serum actually suitable for sensitive skin? 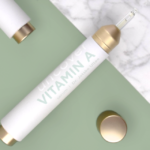 The active ingredient in the Serum is an effective and mild form of Vitamin A. Alongside this, the product contains, in particular, soothing and skin barrier repairing ingredients. It is, for every skin type, still sensible to increase its use gradually. This particularly applies to sensitive skin. As we also advise for all other products with active substances, it is sensible to first test the Serum on the under arm. After that, begin by applying once or twice a week. Eventually you can apply the Serum each evening. 7. Can I use the Serum during pregnancy?